25 April…..not just any day on the calendar but a day to commemorate the men and women who have served in our defence forces and remember those that have fallen. 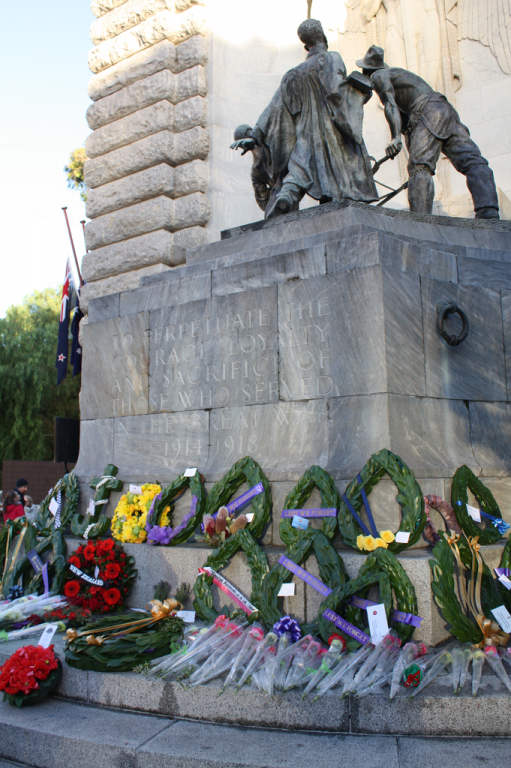 This ANZAC Day was even more significant as 2015 marked 100 years since the landing at Gallipoli during World War One, where the legacy of the ANZAC was born. 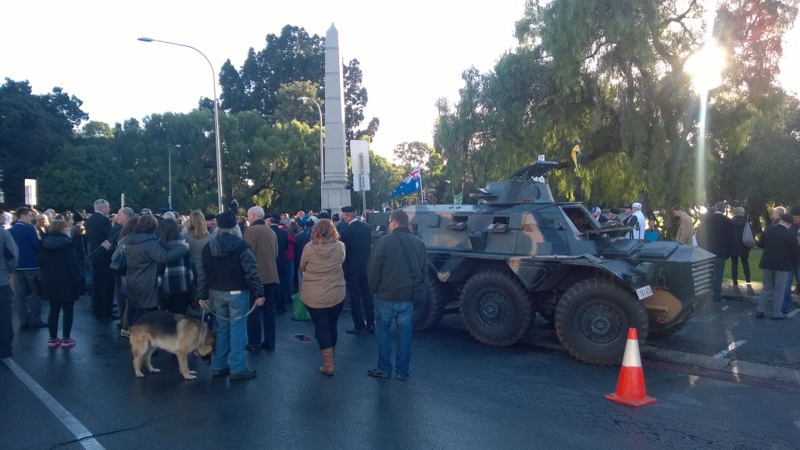 The day started early with many attending dawn services across the state, including a massive crowd at the War Memorial in Adelaide. Once the sun rose, it was soon time to start forming up for the March through the city, beginning on North Terrace and heading down King William Road. 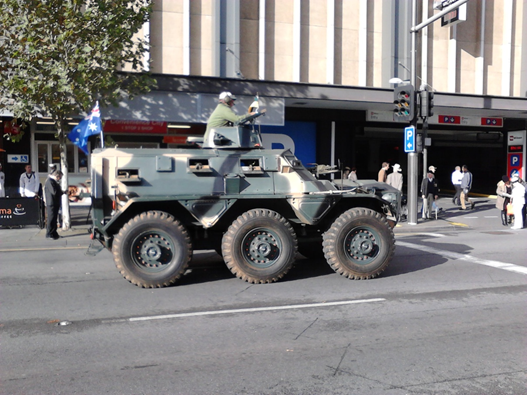 Historic military vehicles, Red Cross cars and Defence vehicles arrived early at their appropriate positions. 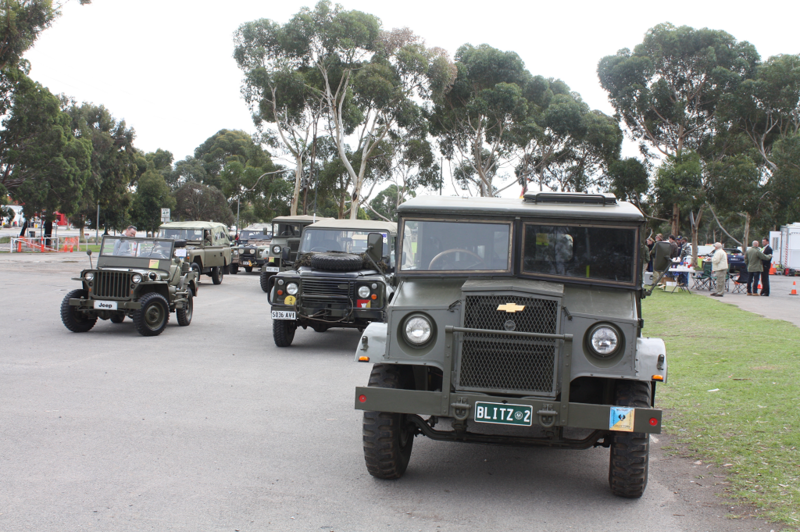 Veterans came from far and wide and when they catch a glimpse of the military vehicles that they remember driving during their service, they were eager to stick around for a conversation and a chance to reminisce. 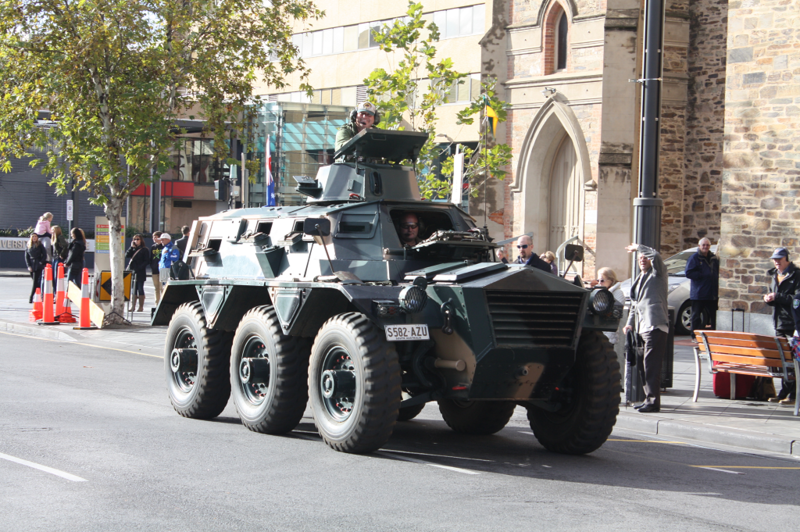 However, what nobody will forget is the sight of a Saracen being driven down North Terrace, weaving in and out of people and vehicles, on its way into Rundle Mall for the ANZAC Day commemorative display. 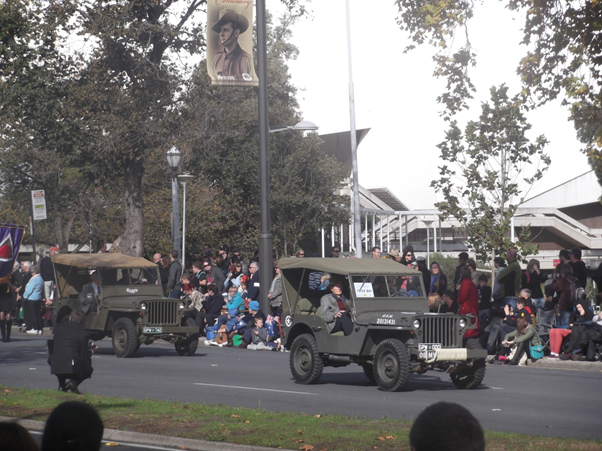 As the start time drew closer, the drivers and their loading skills helped the ever smiling veterans into the vehicles, making sure that they were comfortable, secure and that their waving hand was working. I was in the Group 5 transport pod, with a couple of very nice looking jeeps, including the ever famous Reggie and a first time driver Liam; and, who you say, were the lucky veterans with us? that would be Doug and Alec, two mates from the 10/48th Battalion. Being one of the very few women drivers on the day, I received a couple of comments (all in good spirit of course!) as I got into the jeep ready to set off. This included “are you sure that you know how to drive a jeep?” – They were pleasantly surprised when I said I had been driving a jeep for 11 years. The 10/48th Battalion flag bearers, who were going to walk just in front of the transport pod said “promise, you won’t run us over!” – They were still standing at the end of the march, so I guess I achieved my objective there. With military precision, at 0930, the police horses set off, marking the start of the march and as each group moved off, the transport pods roared into life, joining the convoy down to the Cross of Sacrifice. Now, I knew that 25 April 2015 was going to be big, but it wasn’t until I was driving down the streets that it really sank in. Both North Terrace and King William Road were lined with a sea of people, 6 rows deep, all clapping and cheering for each and every veteran; you would be forgiven for feeling a little emotional and proud of the Australian spirit. After passing the saluting points, including the Governor, we crossed the bridge over the River Torrens, smiling for the TV camera (of course!) and heading down Sir Edwin Smith Drive for the dismissal/dispersion area. Having returned both Doug and Alec to their families, I received a kiss and a hug from both men as a thank you – it was an absolute pleasure and an honour, they were both so lovely and I hope to see them next year. 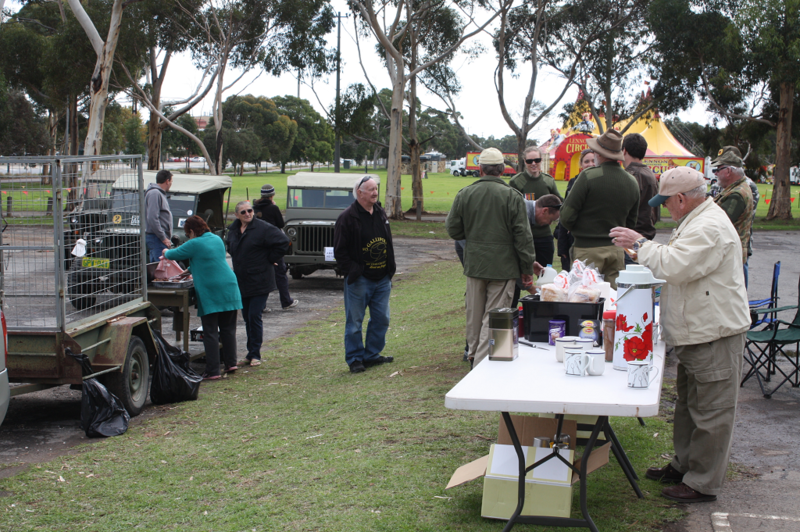 Following the march, each driver headed to Bonython Park for a BBQ for a chance to debrief and reflect on the morning that had been – however, looking in the distance, there were dark black clouds heading our way. As suspected just after lunch, the heaven’s opened and we took this as a sign the universe was telling us it was home time – THE MISSION WAS ANZAC DAY 2015 AND THE MISSION WAS A SUCCESS.